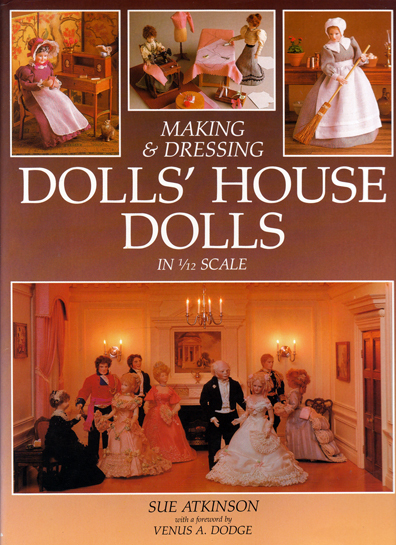 Description: "This delightful book is a comprehensive guide to every aspect of making and dressing one-twelfth scale dolls' house dolls. Master craftswoman Sue Atkinson helps you develop your skills and your imagination to produce exquisitely dressed and authentic dolls in period style, lending a charming and professional touch to your miniature rooms and houses. The author gives full details of the specialised techniques needed to achieve realistic and high-quality results in this scale." Includes full-size patterns for women's, men's, and children's clothes with variations for Summer and Winter, plus evening and daywear. Also features instructions for hairstyles, hats, footwear, and accessories. Illustrated with lovely b&w sketches, plus beautiful full-page, and double-spread colour photographs of various period doll-house scenes. Coffee coloured cloth boards, with gilded text on spine, are in mint condition. Unclipped jacket has some minor scuffing along its upper extremities, and there is some fading on the spine from sunlight exposure. Internally, the book is brand new. Pages are printed on glossy paper. Measures 25.5 cm × 21.5 cm (10.2″ × 8.6″). 4to. 192 pp.